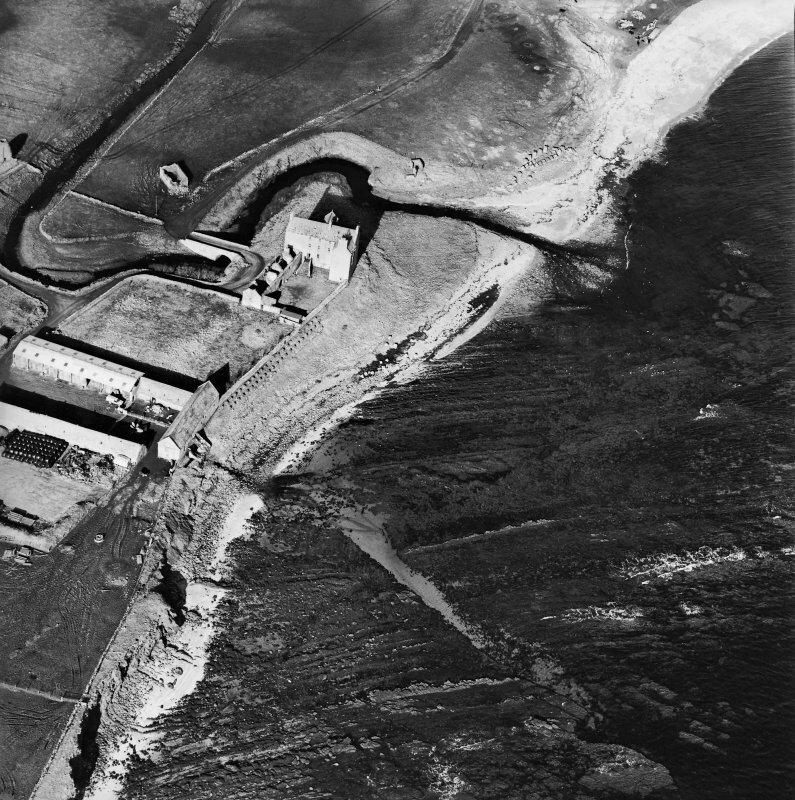 Oblique aerial view of the castle, bridge, farmsteading and the remains of the mausoleum, dovecot and anti-tank blocks, taken from the E.
Oblique aerial view of the castle, bridge, farmsteading and the remains of the mausoleum, dovecot and anti-tank blocks, taken from the NE. 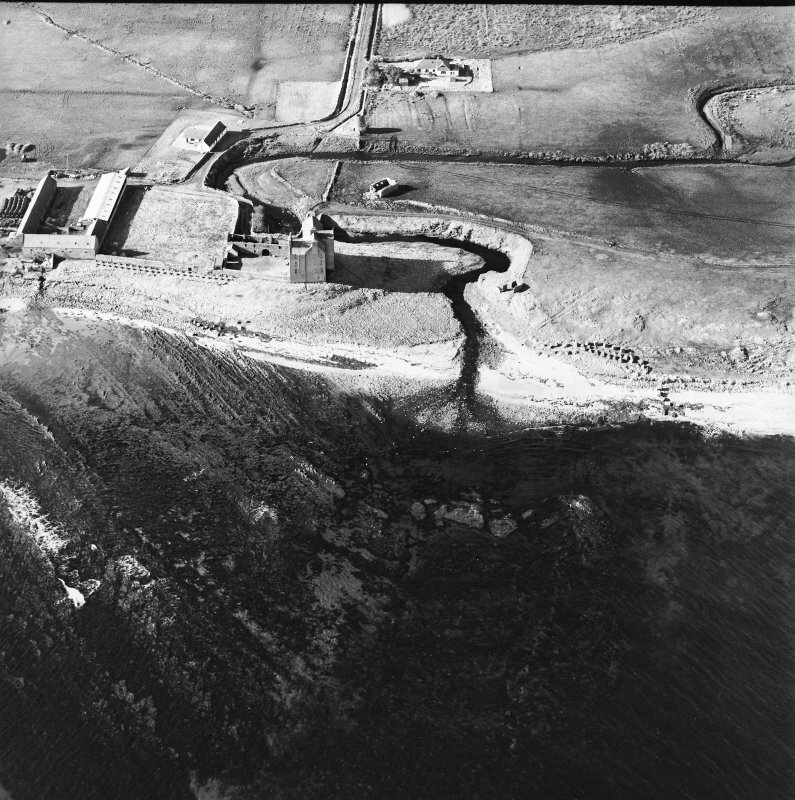 Oblique aerial view of the castle, bridge, farmsteading and the remains of the mausoleum, dovecot and anti-tank blocks, taken from the SE. 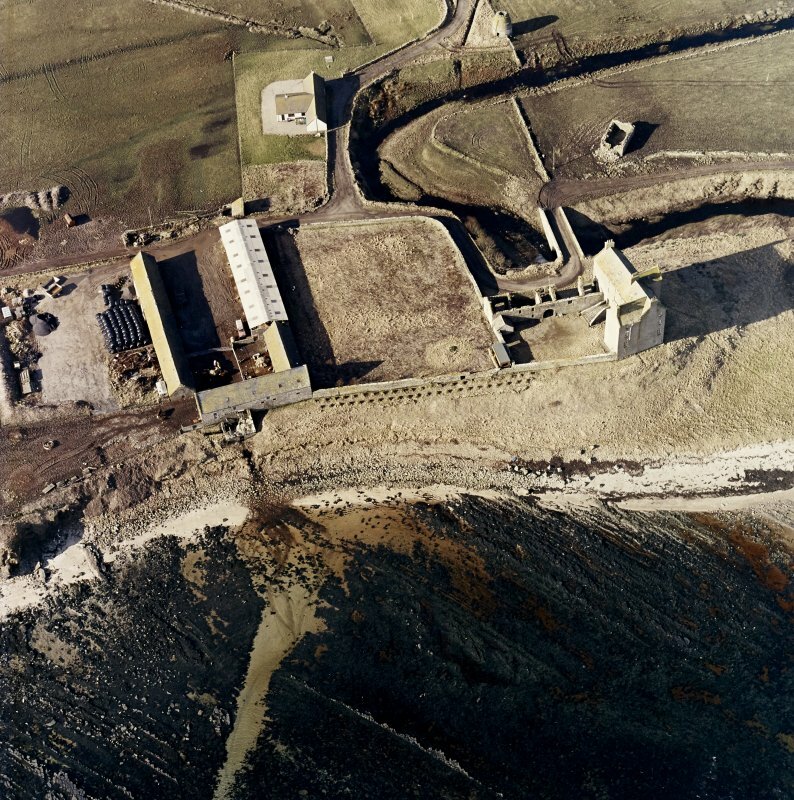 Oblique aerial view of Freswick Castle and bridge, looking E.
Oblique aerial view centred on Freswick Castle, taken from the SSE. Oblique aerial view of Freswick Castle and bridge, looking SSE. 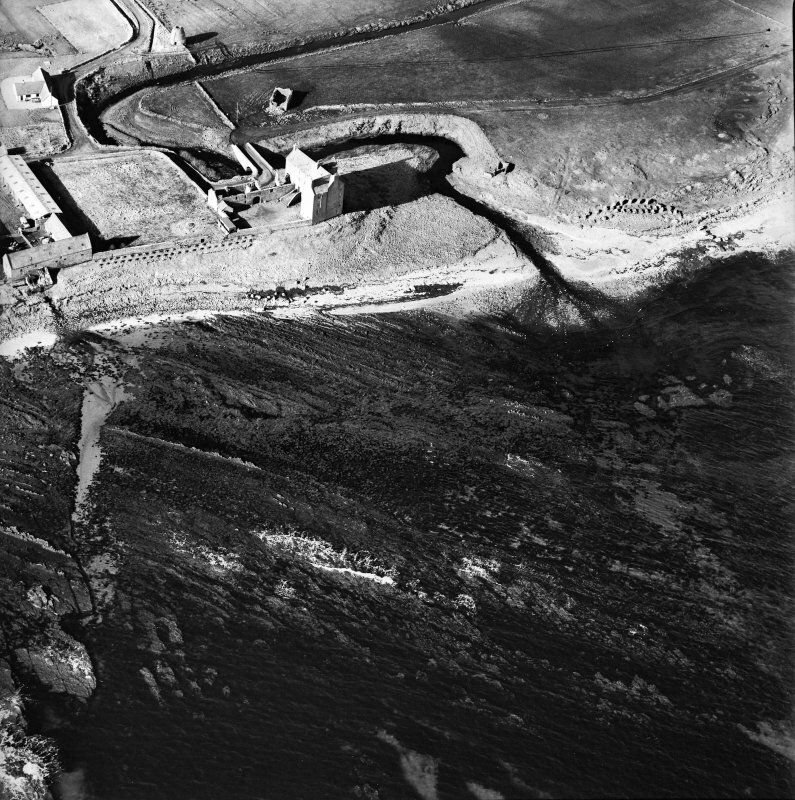 Oblique aerial view of Freswick Castle and bridge, looking SW.
Oblique aerial view of Freswick Castle and bridge, looking NNE. 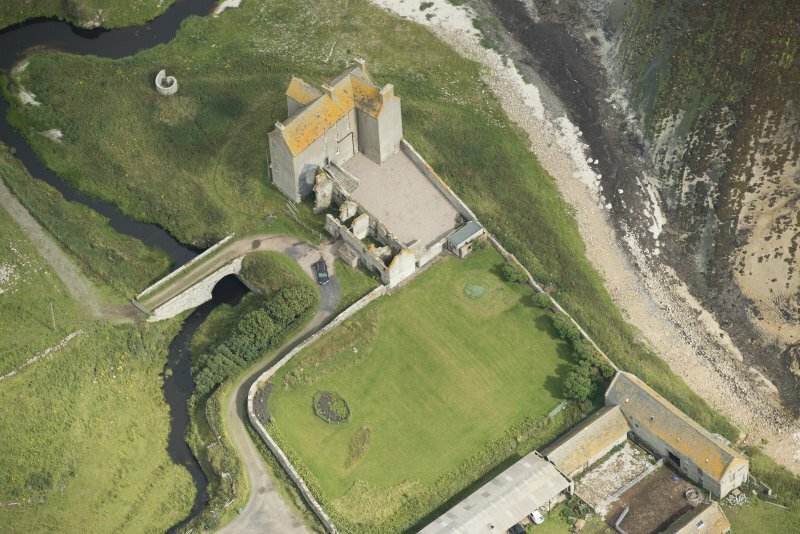 Oblique aerial view centred on Freswick Castle, taken from the ESE. 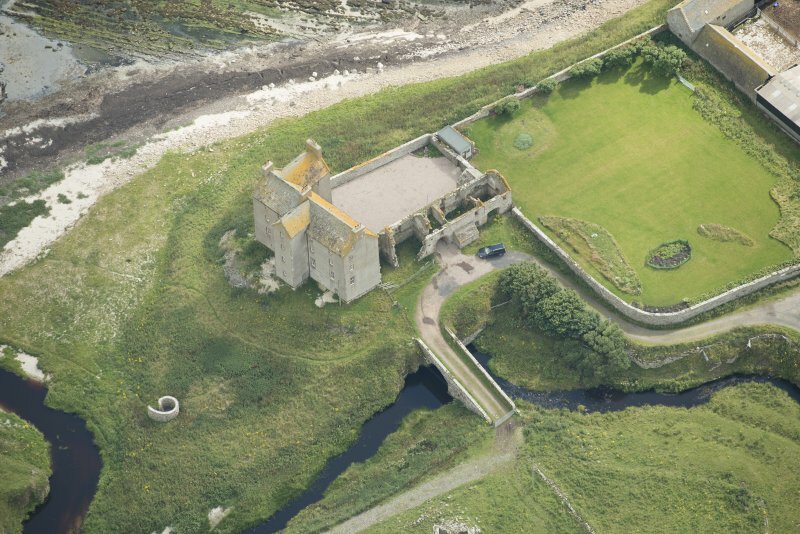 Oblique aerial view of Freswick Castle and bridge, looking ESE. 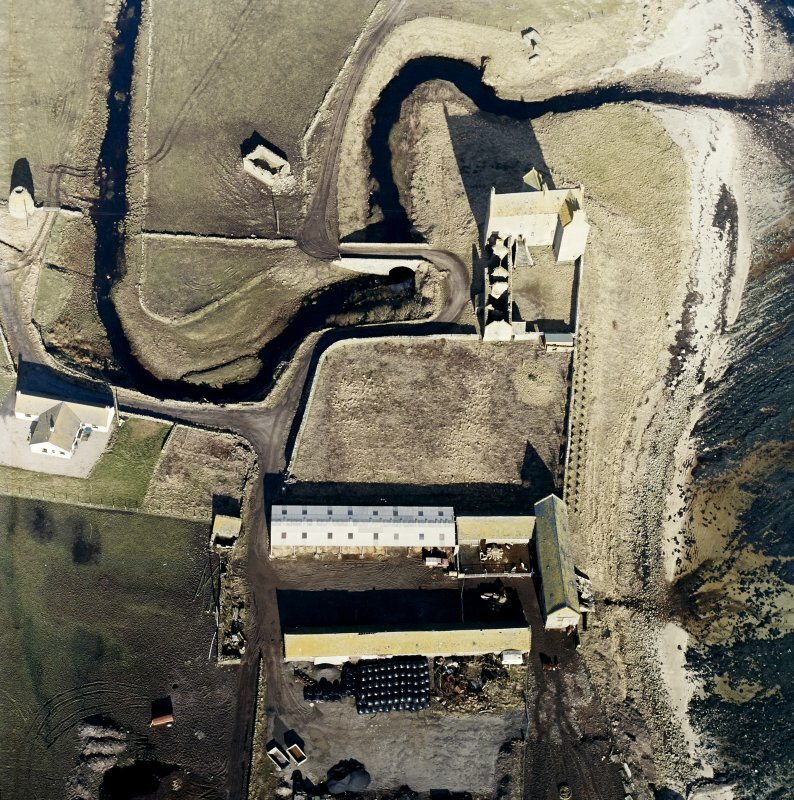 Oblique aerial view of Freswick castle, bridge, farmsteading and the remains of the mausoleum, dovecot and anti-tank blocks, taken from the E.
OS (GIS) AIB, April 2006. 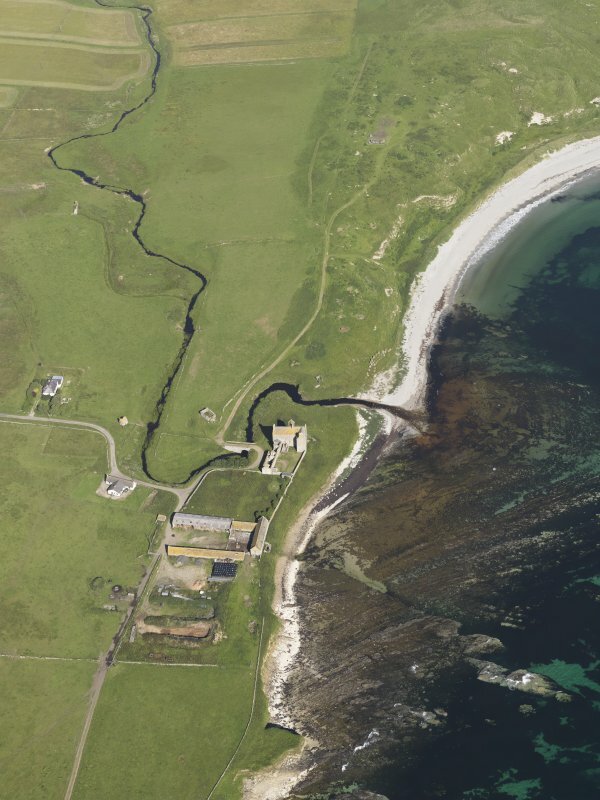 Freswick House is a tall tower-like building, probably of the early 17th century with 18th century additions, standing on a knoll and overlying an extension of the Freswick Links occupation site (ND36NE 4) characterised by a dense concentration of grass-tempered pottery in a midden layer, and possibly early structures, beneath the N part of the house (Morris, Batey and Rackham 1979). The main building, five storeys high, lies roughly E-W, with its stair-tower midway along the N front. A later wing projects S from the E end and contemporary offices from the W end. The walls are harled and the gables of the earlier structure are crow-stepped. 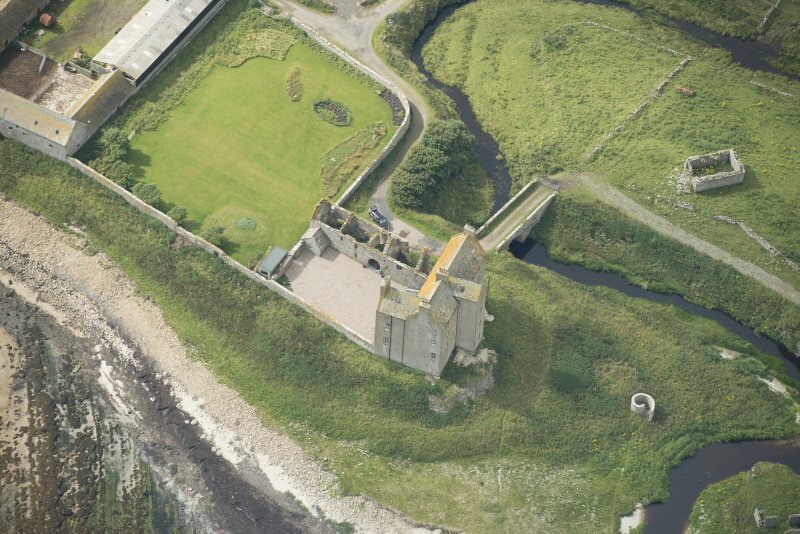 The house, built by the Mowats is mentioned as 'the manor place of Burnesyde with the mill' in 1653 (see (M) 1). 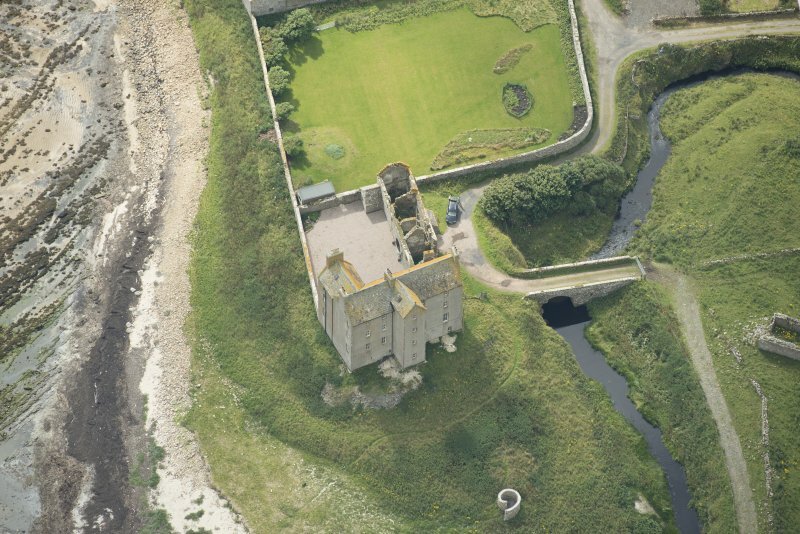 In 1661 it passed to the Sinclairs, and by about 1725 it was known as the House of Freswick, as opposed to the Castle of Freswick, which name is applied to ND36NE 7. 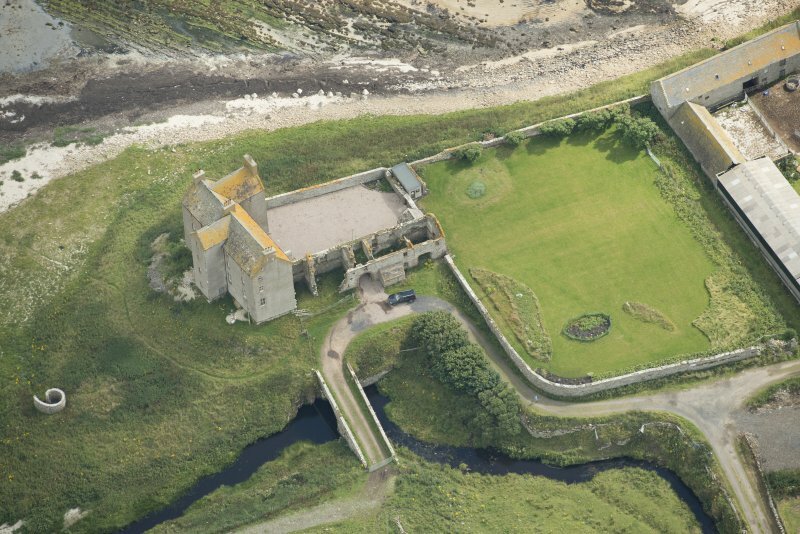 It appears to have retained this name until the modern house at ND 3762 6708 was built, when the name 'Freswick Castle' was applied to it. The existence nearby of a beehive shaped dovecot (ND36NE 8), generally accepted as being a 16th century form, might indicate an earlier house at the site, but it is equally possible that it is simply late of its type. Although uninhabited in 1962, the house was being maintained and in 1979 was being prepared for renovation. ND 3779 6712. A small-scale emergency excavation in 1979 in the gardens by Durham University revealed structural traces but no dating evidence. 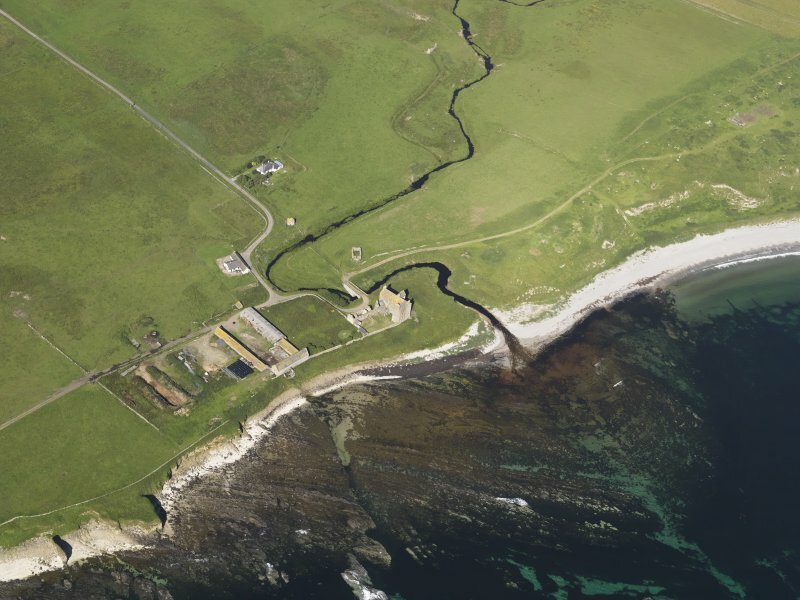 Substantial stone slabbing could represent croft remains or a farm building. It is now tree-covered. 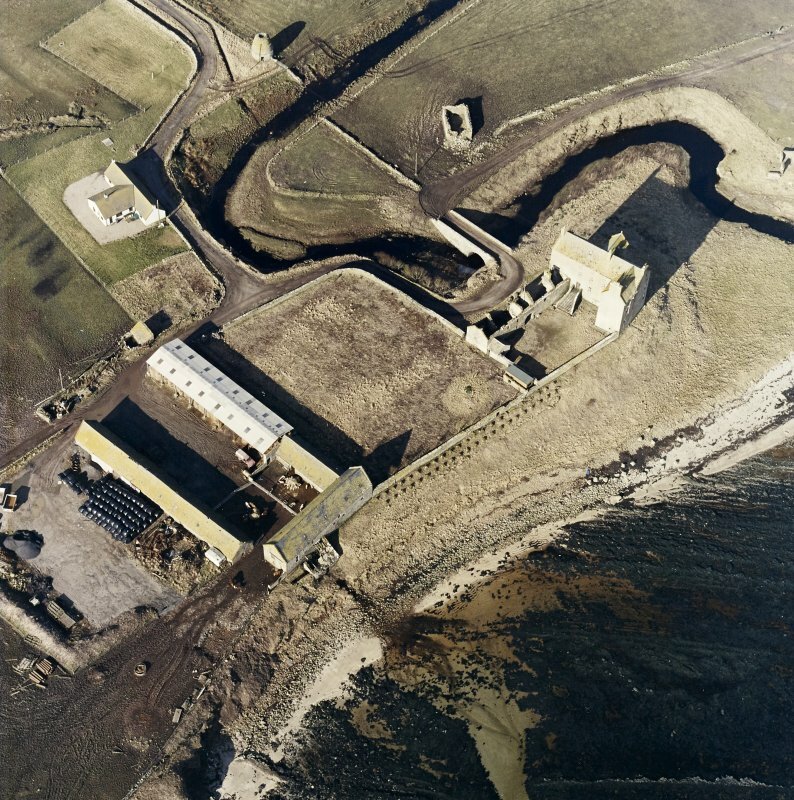 Orig Paroch Scot 1955; J Macfarlane 1906-8; J Mowat 1931; N Tranter 1962-70; C Morris, C Batey and D Rackham 1979; C Batey 1982; Visited by OS (R D) 10 September 1962; HBD No. 6. Visited by OS (J B) 21 July 1982.